Southern freshman Jaiden Proffit drives near the top of the key, during Saturday’s non-conference game in Racine, Ohio. RACINE, Ohio — One thing’s for sure, these aren’t last year’s Lady Raiders. 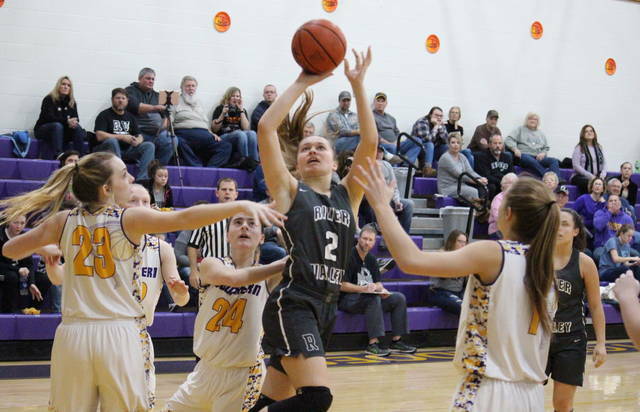 The River Valley girls basketball team surpassed its 2017-18 win total in just its fourth game of the season, as the Lady Raiders picked up a 59-30 victory over non-league host Southern on Saturday afternoon in Meigs County. The Lady Tornadoes (0-3) led 2-0, but River Valley (3-1) claimed the next eight points and never relinquished its lead. The Silver and Black led 10-6 at the end of the first quarter, but Southern trimmed the deficit to one possession, at 12-10, with a 4-to-2 run in the first 1:40 of the second period. 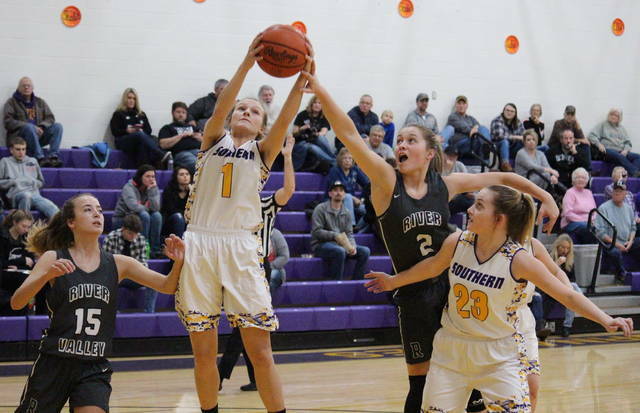 RVHS held the Purple and Gold to just two points over the remainder of the half, however, as River Valley poured in 19 points and headed into the break with a 31-12 lead. 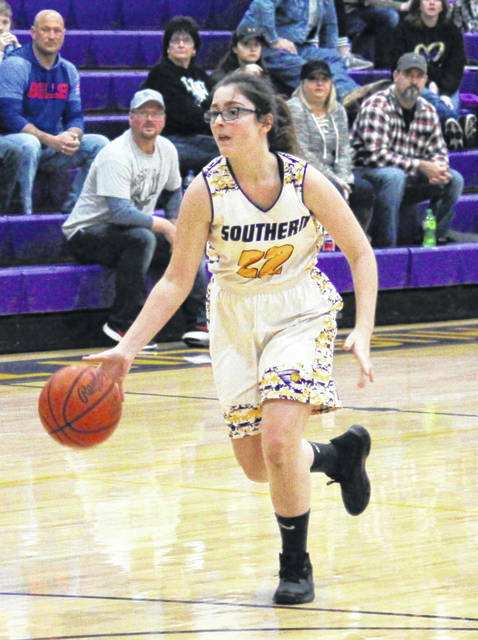 River Valley stretched its lead to 26 points, at 41-15, 5:30 into the second half, but Southern closed the third period with an 8-2 run, trimming the RVHS advantage to 43-23. The guests claimed the first 14 points in the finale and cruised to the 59-30 victory. Following the contest, RVHS head coach Stephen Roderick talked about his team’s game-by-game improvement, while sympathizing with the inexperienced Lady Tornadoes. “We’re improving with each game, we’re slowing getting better, but it’s a process,” Roderick said. “Southern is a young team, I know all too well about being in that situation. We’re just starting to do some things better, but by no means are we ready to say we’re great yet. Lady Tornadoes head coach Alan Crisp acknowledged his team is managing expectations, and looked to cutting down on turnovers as a positive takeaway from the game. In the win, River Valley connected on 24-of-67 (35.8 percent) field goal attempts, including 4-of-12 (33.3 percent) from beyond the arc. Meanwhile, Southern was 11-of-52 (21. percent) from the field, including 2-of-13 (15.4 percent) from deep. At the charity stripe, RVHS was 7-of-16 (43.8 percent), while SHS was 6-of-14 (42.9 percent). The Lady Raiders claimed a 44-to-38 rebounding advantage, including 19-to-13 on the offensive end. Collectively, RVHS had 16 assists, 17 steals, four blocked shots and 14 turnovers, while SHS marked eight assists, seven steals, four blocked shots and 26 turnovers. The Silver and Black were led by Lauren Twyman and Hannah Jacks, with 15 and 10 points respectively. The duo also paced the RVHS defense, with Twyman recording four steals, and Jacks rejecting four shots. Savannah Reese tallied nine points in the win, Kelsey Brown added eight, while Sierra Somerville recorded seven points and team-highs of 11 rebounds and four assists. Lexi Stout and Kaylee Gillman had four points apiece in the win, while Destiny Dotson scored two. 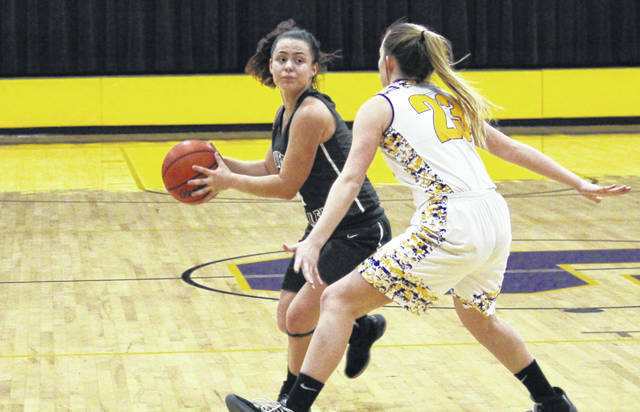 Kayla Evans led the way with 18 points for the Lady Tornadoes, while also marking a team-best three steals. Phoenix Cleland tallied seven points to go with team-highs of 12 rebounds, four assists and two rejections. Brooke Crisp and Caelin Seth scored two points each in the setback, while Shelby Cleland added one marker. After hosting Alexander on Monday, River Valley will head to Wellston on Thursday. Following a trip to Waterford on Monday, Southern will travel to South Gallia on Thursday.